Fill up your laser printer with the Brother TN230M Magenta Toner Cartridge and enjoy premium quality printing. High page count You'll be able to achieve sharp, vibrant results across 1400 pages with the TN-230M Toner Cartridge, the high-yield cartridge performing brilliantly and delivering bold, crisp-looking documents for a long time. Give your images and documents the best magenta-based colours and tones with this great laser printer toner. First-rate print quality This great toner has been crafted to meet Brother's uncompromising standards of high quality resolution, grey scale and block colour. This means you needn't worry about whether your documents are going to turn out how you want them while the toner is full. You'll be suitably impressed by the peerless sharpness and consistently reliable print quality of this laser printer accessory, best used with a Brother printer. Eco-friendly The TN-230-M Magenta Toner Cartridge is totally recyclable, so used components can be returned to the manufacturer so you know you're doing a little bit more for the environment. 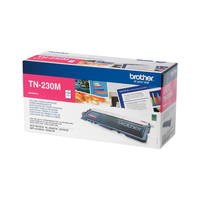 The Brother TN-230 Cyan Toner Cartridge delivers beautiful-looking, reliable print results you can always trust.